If there is one thing that natural childbirth advocates are absolutely, positively, 100% certain about, it is that “physiological” childbirth is always best. That’s why they are absolutely, positively, 100% certain that induction of labor for “no better” reason than that the mother wants to be induced is harmful. Therefore, as the evidence mounts that induction of labor is safer than expectant management, there is no one more unwilling to accept that evidence than natural childbirth advocates. That explains why Henci Goer is looking for any possible reason (even a perverse reason) to ignore the findings from a new paper. This echos the findings of Neonatal Outcomes After Implementation of Guidelines Limiting Elective Delivery Before 39 Weeks of Gestation by Ehrenthal et al published in the journal Obstetrics and Gynecology last fall. This finding is not unexpected. 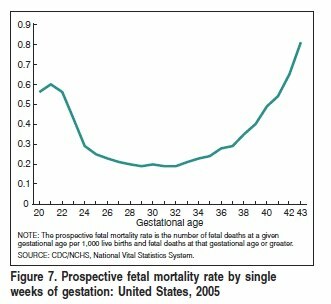 CDC data shows that the stillbirth rate rises from approximately 3 per 10,000 at 37 weeks to 4.5 per 10,000 at 39 weeks (see graph below). That assumption in clearly not justified. That’s because low rates of perinatal mortality have been achieved, in part, by exchanging mortality for morbidity. There are fewer deaths when you deliver babies before 41 weeks (even for elective reasons); those babies who otherwise would not have lived experience relatively mild, self limited problems related to borderline prematurity. That appears to be what happened here. Saying “no” to induction and to other interventions that are becoming routine takes courage and confidence, as well as the knowledge that women have the right to informed refusal. 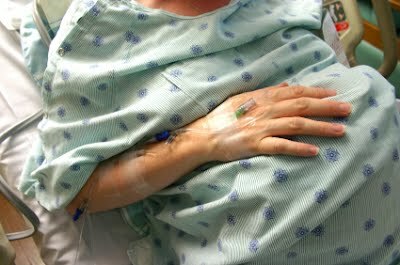 What women learn from you about nature’s plan for labor and birth, including the beauty of waiting for labor to start on its own and the risks of interfering without clear medical indication, will insure that the women you teach will have the information they need to confidently say “no” to routine induction. Therefore, it is hardly surprising that they refuse to accept the scientific evidence. Indeed, 1 of the 4 rapid responses to the paper is from a midwifery group desperately trying to deny the findings. Now Henci Goer has weighed in attempting to criticize the study. Ironically, even if her claims were true, they would argue for MORE inductions of labor, not fewer. Goer complains that researchers compared women who had purely elective inductions with women who had expectant management. The authors explain how they created the comparison groups. We categorised the women as having elective inductions if they had no medical indication for induction of labour. The indication for induction of labour is not recorded on Scottish Morbidity Record 02, unlike medical complications of pregnancy. The presence of the following conditions was assumed to confer a medical indication for induction: hypertensive or renal disorders, thromboembolic disease, diabetes mellitus, liver disorders, pre-existing medical disorder, antenatal investigation of abnormality, suspected fetal abnormality or fetal compromise, and poor obstetric history (previous stillbirth or neonatal death). In the absence of any of these conditions being recorded, we considered the induction of labour before 41 weeks to be elective. … [I]nvestigators did not compare similar populations. They isolated a low-risk—I may even say ultra-low-risk—group of women and compared them with everyone else, including women with the high-risk conditions listed above! In other words, Goer insists that women in the expectant management must have had medical indications for induction and therefore more women in that group SHOULD have been induced. It’s an absurd argument: If only doctors had induced more women in the expectant management group, the results would be comparable. Duh! That’s the whole point of the paper. Induction improves mortality compared to expectant management! As a general matter in science, the simplest explanation of findings is usually the best explanation. The authors compared women who were induced without medical indication to those treated with expectant management and found the the induction group had a lower death rate. The simplest explanation is that induction (even social induction) improves outcomes. Instead Goer reaches for a convoluted explanation: Doctors performed too many inductions in the induction group and not enough in the expectant management group. Nice try, but not enough. Induction improves mortality rates. How unfortunate for natural childbirth advocates that once again “physiological” childbirth is shown t0 have no advantage over the interventions of modern obstetrics. In fact, “physiological” childbirth actually has a higher rate of perinatal death.